Spring is upon us and that means one thing if you are a sand martin— it's time to travel north. The seasonal migration for the beautiful swallow-like bird can be as long as 5,000 miles as they fly from eastern and southern Africa to their Spring nesting roost in Europe. The trip is no small feat, they brave hunger, exhaustion, and predation, but when they do arrive to their nesting grounds in Europe, they can finally rest. Well, that's how it's supposed to be. But for the sand martin flock that landed at the cliffs of Norfolk, UK, their journey is far from over. When the birds landed at the Bacton cliffs they must have been confused by the strange black netting that was standing in the way of them and their nets. The contraption had been put up by the North Norfolk District Council long before the birds arrived with the hopes of encouraging the martins to nest elsewhere. But, predictably, the birds didn't get the message, instead, some of them tried to force themselves through the holes to reach their nests, others tragically became stuck and died. Now the entire nesting season for these incredible birds is at risk because the council wants to protect a local Shell gas terminal among other structures. The council says the £22 million 'sandscaping' project will protect a local Shell gas terminal among other structures from sand erosion, but at the cost of hurting hundreds, maybe thousands of birds. The city plans to use sand from the local seabed to reinforce the area cliffs. This sand will likely end up covering the sand martins nest altogether. Bird lovers from around the world are now demanding that the council take the netting down so that the martins can nest. Protests have been held and Facebook groups have been formed. The outrage has convinced the city to backtrack a bit, they have agreed to remove some of the netting, but it isn't enough. The entire contraption should be removed because it doesn't just threaten the lives of the sand martin but also the other animal species that rely on the area for their survival. 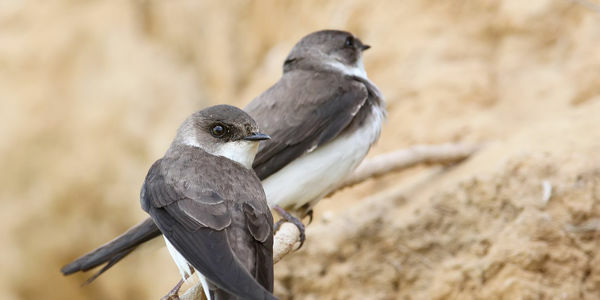 Tell North Norfolk District Council that they need to figure out another way to protect the area from erosion and that any project they choose must take the sand martin into consideration. Sign the petition.